I started making these again around 2000, and I’ve been refining ‘em ever since. It’s a true fish- think of it as two single fins, side by side; two rails, two fins, two tails. It needs a rail in the water: commit your turn and you’ll fly! A couple of things you need to know about this board. One: its not rockered to be super short- a typical 5’9 bloke should ride something between 5’9 and 5’11. 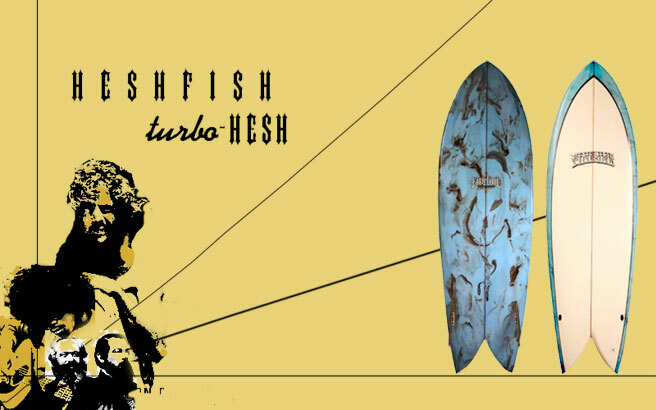 The turbo looks virtually the same on the net as a hesh, but in fact it has a curvier template, a more even thickness/rocker distribution, and a different bottom template that’s mush friendlier. Also the tail split is shallower by 1 1/2” to 6 1/2”, which eliminates quite a few foot cuts and bruises. Both boards come with custom two-side foiled, removable keel fins.